Diary of a Goldfish: 37 - A review of the year. Today I am 37 years old. This year has been very much more about being than doing, but I've spent a lot of relatively idle time very well. Lots of books, lots of TV, lots of films, lots of time lying around in the garden. Lots of drugs too, although they've been less fun and have meant very many short periods of time – a few hours, a morning, an afternoon here and there that probably add up to a good chunk of the year – passed in a blur. For the first time since the henna years of my early twenties, I dyed my hair. I have considered the prospect of colourful hair for ages - probably most of my adult life, but I was inexplicably nervous and worse - ten years ago, I thought I was probably too old to have purple hair. Early in the year, I was suffering quite a bit, hardly doing any of what makes me myself, so finally colouring my hair (or Stephen doing it for me while I lay on the floor with old towels and bin-liners over a pile of pillows) was a profound assertion of identity. It also helped that I worked out that blues, greens and purples go nicely with my natural brown hair, so I avoided some of the pitfalls of dying my entire head (such as needing to keep it up on a schedule) by dying streaks and the ends of my hair. I'm very happy with it. I bought a lot of cheap terracotta pots, painted patterns on them and planted things in them. And I mean a lot of pots - at least a few dozen. I painted my walking stick. I painted a few canvases. I painted a whole load of dried up poppy heads. Other things too - I've done a lot of painting. Stephen and I started a virtual tour of the UK through books, reading one novel set in each county. We started in Cornwall and we're now in Anglessey. This is a lot of fun. With the considerable help of my parents, we decorated our bedroom. This has made life considerably more comfortable, even though it was one of those things where something only bothers you when you have the opportunity to change it. The old paint colour was so faded that we literally have no idea what shade it once was - it could have been a blue, it could have been a brown. Now it is an actual colour and that colour is green. 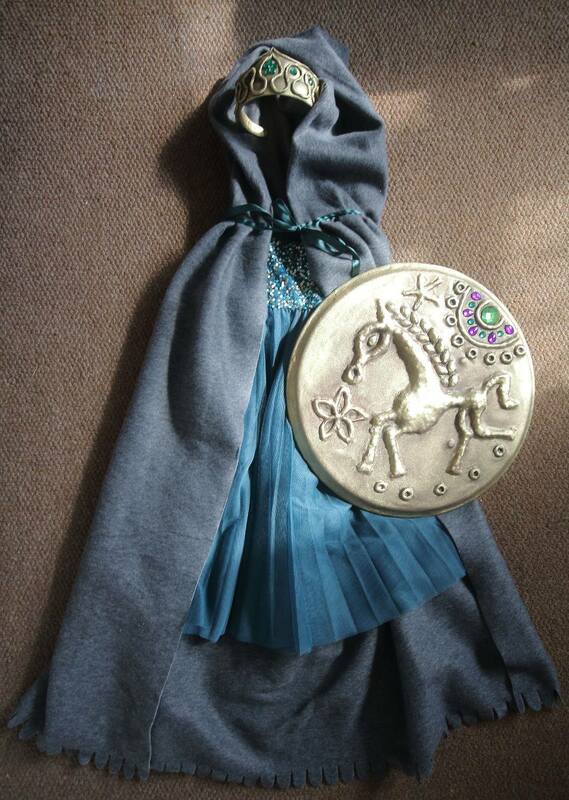 In the summer, we made a Boudica outfit for our niece Sophie. I wasn't really up to using the sewing machine, so our efforts went into making an awesome shield. And it was awesome and she loved it. The fact she thought it was a Viking costume only demonstrates what a clever girl she is to know that Vikings did not typically wear horned helmets and included women warriors. Because of my increased level of impairment, we started this year in a bit of a mess, but we've got much better at organising ourselves, asking for help and accepting help when offered. I'm really proud of us, as well as friends and family who have supported and encouraged us. Stephen and I played some Zombicide, a tabletop game and far more importantly and impressively, Stephen developed a team of disabled characters in order to increase representation in the post-apocalypse. We grew a lot of food including a load of chilis, various salad leaves, potatoes, turnips, sweetcorn, various beans and peas, kale, and tiny sprouts and carrots. I also had much more success with growing flowering plants from seed and cuttings. After a long saga and spending way too much time and energy coping with pain this year, I finally saw a pain specialist in November and feel very much more positive about the future. I have already been putting new strategies in place and there will be pharmaceutical experiments in the new year. All singing, all dancing, all rather toxic - a review of Crazy Ex Girlfriend. I believe in straight people - answering one of those articles which claim everyone is bisexual. Shedding light in dark places - a review of The Keepers Why are TV bisexuals such complete jerks? We need to live before we're helped to die about assisted dying. I'm currently planning to start a new blog, and leave Diary of a Goldfish pretty much as it is. I've blogged her for nearly 13 years and in recent years, I have slowed right down and wound up posting occasional epic posts. 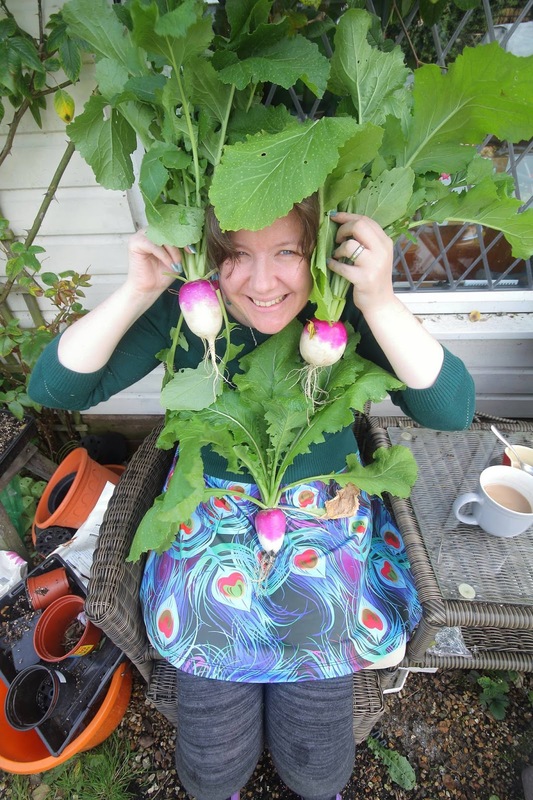 I want to write more short blogs about various bits and pieces, and I especially want to blog about my garden; it means so much to me and I want to share some of that joy with other people. So the new blog may be garden-focused but with plenty of social justice and general nonsense in the mix. Well, we'll see. I hope everyone reading this has a happy and comfortable festive period and a super New Year! 1. 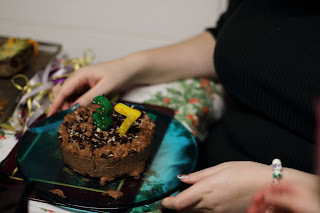 A chocolate birthday cake with two candles in the shape of a three and a seven. Pale-skinned hands are holding onto the plate. 2. A chili plant in a patterned pot on a window sill. 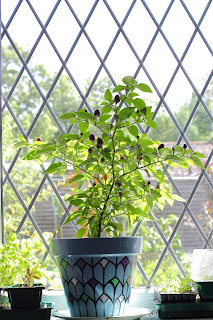 The chili plant has small dark fruit on it and looks rather like a miniature tree. The pot as has geometric pattern in pale blue, black, purple, green and white. 3. 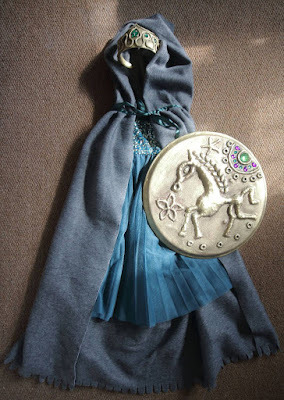 A Boudica outfit consisting of a teal party dress, a grey cloak that looks like wool but is made from a fleece blanket, a gold crown and shield. The shield has a stylised horse and sun on it as well as some gemstones and is based on an Iceni coin.